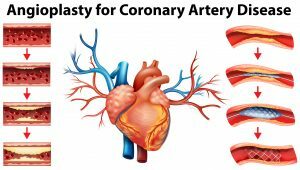 Coronary Intervention also known as Coronary Angioplasty is a medical procedure that is utilized to expand the narrowed or blocked coronary arteries, which supply blood to the heart. Angioplasty, together with stent placement, has become one of the most common treatments for heart disease in recent years. The procedure is carried out by inflating a small balloon inside the artery to widen the vessels and improve the blood flow to the heart. The arteries that transport blood away to the heart muscle itself are blocked by build up of “plaque” or inflammatory and fatty substances that impede blood flow to the heart. During an angioplasty procedure, stents are placed in the coronary artery to keep the plaque back and widen the blood vessel lumen and increase the blood supply to the heart. Angioplasty is performed by one of our Interventional Cardiologists in a Cardiac Cath Lab, under local anesthesia and moderate conscious sedation. The patient will lie comfortably on their back on an X-ray table. The area of catheter insertion, either the groin or wrist is shaved and a local anesthesia is injected to anesthetize the area. Arterial access is achieved and a sheath is placed temporarily in the artery. A catheter is then threaded to the heart arteries for contrast injection called an angiogram to determine the extent and location of the blockage within the coronary arteries. The catheter is moved under the guidance of X-ray images to reach the area where the blockage is located and to check the pressure inside the pumping heart. The best strategy is discussed to make sure the patient understands the risks and benefits of each approach, and the long term care plan associated with each option. Current guidelines favor conservative medical management first, but an informed patient preference is the main consideration. If coronary revascularization is the choice, and angioplasty and stenting is the approach agreed upon, the interventional cardiologist will insert a guide wire through the catheter, moving it across the blockage. Through a guide catheter, over a guide wire placed across the blockage, a balloon is inflated to laterally and longitudinally displace and move the plaque against the artery wall. This opens up the blocked artery and increases the blood flow to the heart. Frequently, a stent made up of laser cut stainless steel or cobalt chromium is placed within the artery to keep the artery open. Once the interventional cardiologist has confirmed that the artery has been successfully dilated with the stent in place, the balloon is deflated, and the guide wire and the catheter are removed. The stent will remain in place within the artery. Modern stents are coated with drugs to prevent restenosis or scarring of the vessel at the site of intervention. Vascular access closure is then achieved and the patient can be discharged soon thereafter. Restenosis can occur but usually within the first six months. Restenosis is the re-accumulation of plaque or scar tissue producing narrowing or blockage of the coronary artery. For more information or to schedule an appointment with one of our cardiologists please call 904-423-0010.